I guess the obvious question is why did LUSS and now the SWCC spend most of their summer, grovelling around in the cold and damp caves of the Picos, covered in mud and grit, tired hungry and generally miserable? I’m not going to go into the usual arguments around, exploration, adventure, ‘because it’s there’ etc. but the following post briefly details a little bit of the motivation and competition related to the specific exploration in this area. 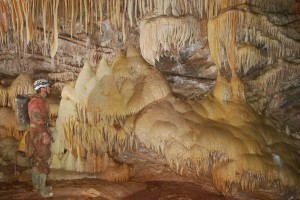 The main goal of the work, undertaken by LUSS and now by SWCC, is to attempt to find a route through the Eastern Massif mountain range from the deep potholes on top of the range to the resurgence (where all the water draining through the mountain range re-emerges) at Cueva del Nacimiento. At the time of the original exploration, it was believed that such a cave would be one of the deepest in the world. Around the same time as LUSS was exploring the caves of the Eastern Massif the Oxford University Caving Club (OUCC) was in the neighbouring mountain range looking for a similar deep cave to break the records. OUCC, centred around the Ario plateau, were looking for a connection between the potholes in the Western Massif and the resurgence, Culiembro. In particular a deep pothole called Xitu on the plateau was the centre of attention. In 1981 OUCC broke a couple of records, extending Xitu below -1000m, the first British team to achieve such a feat. At the end of the 1981 expedition the cave had reached a depth of -1139m and exploration terminated at a sump. Despite numerous expeditions in the following years these limits in both the caves were not passed. In 2010 the sumps at the end of Culiembro were finally passed and the divers reached the terminal point reached in 1981 at the bottom of Xitu, making a -1264m traverse a possibility. Finally the first full traverse from Culiembro to Xitu (and back) was achieved on the OUCC 2012 expedition. This makes it the 3rd deepest traverse and the World’s deepest diving traverse. The caving world and exploration has moved on since the original exploration and the deepest cave goal is no longer geologically achievable. However, modern mapping and GPS techniques still provide some exciting reading and recent extensions in another deep cave (Torca Jou Sin Tierre) in the Eastern Massif, still give hope for some records to be broken in the next few years. Sima 56 – Cueva del Nacimiento would be a -1475m deep underground traverse, this would make it the 12th deepest cave in the world. It would be a close one but we would just miss out on the deepest cave in Spain which is currently Torca del Cerro del Cuevon-Torca de las Saxifragas at a depth of -1589m. List of deepest caves in the world. 3 members (Phil R, Laurence and David) have been out in Tresviso for the previous week, doing some work in Cueva del Marniosa. Marniosa is situated a bit further up the valley from Cueva del Nacimiento and is probably a filter system into Nacimiento. The cave was originally explored very activily in the 1970′s until the unfortunate death of Tony Harrison (tribute page appears to be down) in 1975. Exploration was largely curtailed after this event. However, some sporadic trips have since occured and the downstream sumps remain a promising lead, heading towards the Western series of inlets in Nacimiento. In 1986 SWCC and others passed the downstream sump and found over a kilometer of new passage and another downstream sump. This sump remains undived. Undettered a plan, outside of the main objectives, has been made to attempt to dive (or at least get to) this sump. Tuesday – madPhil passed sump 1 and reached climb down into stream. Route onwards is up other side of the climb. Exact words were, “not sure how Colin did it, quite necky”. Dive line hanging from roof appears to have been used as a lifeline to get back down the climb in 86. Friday – madPhil half way up climb, manually bolting, expects to be at sump 2 on Saturday. As per normal, the grand plans of keeping a riveting account of the build up to the next Tresviso expedition have fallen by the wayside and it’s now only 3 weeks until the expedition starts properly and I’ve only just set up this newest feed. If I hadn’t accidently deleted last years blog I would suggest it was a good place to start to get the background on the trip, but instead I’ll have to bring everything up to speed with a potted overview of the trip. Hopefully, I’ll be able to get some blogs published while out on the trip, but this year longer underground camps are planned so access to t’internet may be limited. However, there are a number of other expedition members I hope to press gang into publishing some posts. The Picos de Europa is a range of mountains 20km inland from the northern coast of Spain, forming a Westerly extension of the Cantabrian Mountains. It consists of three main areas, the Central, Eastern and Western Massifs. 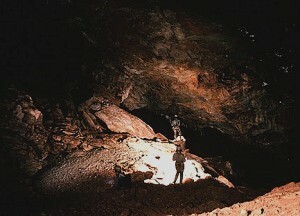 It was the Eastern Massif that drew the attention of Lancaster University Speleological Society (LUSS) in the early 1970s. The early years were spent pushing Cueva del Nacimiento (Cueva del Agua) located at the foot of the mountain range. Over the years this was pushed to around the 11km and +300m mark, but after several years the cave was abandoned as all the major routes sumped and no continuation could be found. LUSS turned their attention to the Andara region higher up the mountain range and sought caves that would drop into the Nacimiento system and create a record-breaking 1500m through trip. They found a number of deep caves around this ‘top camp’ area. Sara, Tere, Flowerpot and Sima 56 were all pushed to respectable depths. 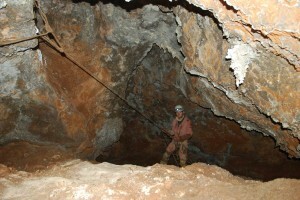 At the time Sima 56 was the deepest in Spain at –1169m deep. Many years were spent pushing the top camp systems but the way through remained elusive and interest dwindled. In 1986 / 87 SWCC and LUSS briefly turned their attention back to Nacimiento and investigated a number of sumps and pushed a bold steeply ascending ramp, gaining over 200m of height at the back end of the Nacimiento system, with a number of leads left unexplored. Since the 1980’s Spanish caving groups have been exploring the area in parallel with the UK trips, concentrating around the Andara region, including the on-going exploration of the -1000m deep Torca Jou Sin Tierre. In 2005 a small SWCC trip found a number of undescended shafts on the top of the Sierra del a Corta. 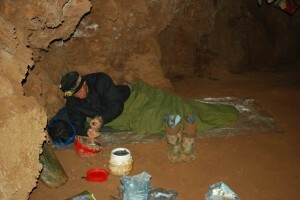 In 2009 a joint SWCC & SBSS trip further explored Cueva del Entre Cuetos, located on the Sierra del Corta. The 1996 limit at -100m was passed and the cave extended down a number of new pitches to an immature, but draughting, stream way. In 2010 SWCC and SBSS spent 10 days examining leads around the Sierra del Corta and Valdediezma, including a number of promising draughting shafts. (T69, T507, T504). Torca Septrin, on the Pico del Moro, was also revisited and extended for around 100m length and -40m depth, with a draughting continuation. In 2011 SWCC Cueva del Nacimiento was successfully bolted and re-rigged all the way through the cave and up to the current limit of exploration in the final Death Race 2000 chamber. The 2012 expedition will be undertaken over 2 weeks from 28th July to 12th August. There are two sumps in Nacimiento which will be the focus of our attention both having huge potential and are certainly the portals into the main drainage network beneath the mountain. The main upstream sump was last dived by the late Rob Parker, in 1986, and remains a significant challenge due to its remoteness, over 4km from the entrance. Tackling this sump will involve multi-days camping within the cave. The known end of the sump is at a depth of -28m and to increase our diving range we plan to use newly developed micro-rebreathers. These devices allow dive times of up to 3 hours in duration and vastly reduce gas consumption and will allow the same cylinders to be used for multiple dives. This approach greatly reduces the amount of equipment that will have to be transported into the cave. The use and development of micro-rebreathers is very much a recent innovation in which members of the team are leaders, this is certainly a scenario in which they have great potential. Should the range of the micro-rebreathers be reached then the team have larger rebreathers at their disposal. The 2011 expedition successfully re-rigged the whole cave to the furthest and known highest point in the cave, the ‘Death Race 2000’ chamber at the top of a series of climbs known as the ‘Teeth of Satan’. Over the deepest part of the chamber are there are 2 unexplored avens. An attempt will be made to bolt climb the avens. Pozo Del Castillo. Reinvestigate the possibility of resuming exploration of the Castillo system, currently at -293m . Torca Septrin, pushed to -140m in 2010. Depth potential of at least -800m, heading for Cueva del Nacimiento.